This creates an opportunity for tech salespeople that can demonstrate the value of their solution. Soft selling skills and schmoozing will only get you so far when you are facing a financially-driven decision maker. The key to making the sale is to prepare the business case for the solution. 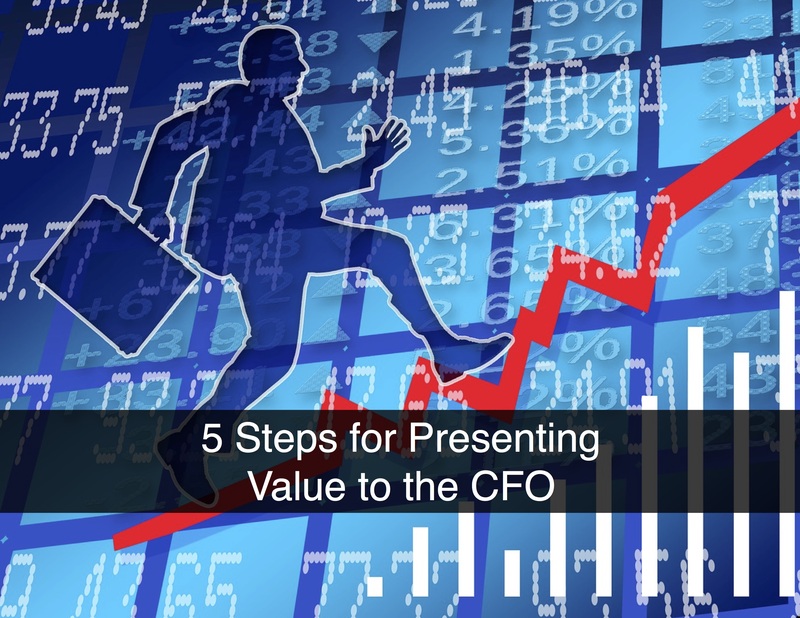 Use the 5 steps below as a guide for persuading the CFO to make the investment in your offering. The fundamental first step it to fill the gap in the CFO’s knowledge about how much, in dollars and cents, your solution can help the company. The CFO is always evaluating and comparing investment decisions. The key understanding for you though is that the CFO is not always comparing your proposed deal to your competitor’s proposed deal. The CFO’s perspective is much broader and they might be comparing an investment in your solution against a decision to open a new sales office. Provide the CFO with the key financial metrics (e.g., ROI, NPV, IRR and payback period) for your initiative. The surest way to figuratively be shown the door is to say, “I can save you time and money.” The CFO wants the specifics. How much? In what areas? Everybody understands that projections are like weather forecasts and they can be wrong. More importantly though, they provide a framework for the CFO to understand what’s possible. Your business case should always be built around your customer’s unique situation. It’s a clever idea though to include supporting documentation such as case studies, benchmark data and analyst reports. Again, this helps frame the range of possibilities. If you think your customer’s situation is like another customer’s situation that you resolved, tell the story of the results. If you think your customer’s expected benefits are an outlier, state why that’s the case. You don’t need to incorporate every PowerPoint feature into your presentation. Instead, spend your time checking your work. Make sure the presentation exudes base-level professionalism and is accurate. Spreadsheets are notoriously prone to errors and your calculations should have a second-level reviewer look over them. Simple mistakes can cause a CFO to discredit your entire body of work. Every solution is not perfect for every company. It’s wise to acknowledge and address the potential downsides. One way to do this is to model a “worst case” scenario in your financial justification. If you try and hide something and it’s sniffed out by the CFO, who by the way is really good at such things, your chances of success just dramatically declined. The keys to persuading a CFO to make an investment in your solution are accountability and transparency. Invest your time to build a credible financial model showing the value your solution can deliver. Configure the analysis to address your customer’s specific problems and don’t be afraid of the downside. The more realistic your approach is, the better your chances of making the sale.